William Faulkner’s 1929 novel The Sound and the Fury seemingly resisted cinematic translation. Widely acknowledged as one of the greatest novels ever written, it employs varied narrative styles including stream of consciousness, non-linear storytelling and shifting perspectives to spin its sprawling tale of the Compson family of Mississippi. 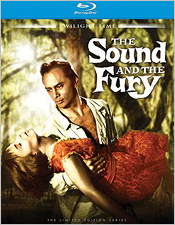 It wasn’t until 1959 that Hollywood finally put its stamp on The Sound and the Fury in a tightly focused film adaptation written by Irving Ravetch and Harriet Frank, Jr., and directed by Martin Ritt. The 20th Century Fox picture has arrived on Blu-ray from Twilight Time. Screenwriters Ravetch and Frank considerably condensed Faulkner’s book for their 115-minute film, distilling it to tell one story with one central character. In the Pulitzer and Nobel Prize-winning author’s novel, young Miss Quentin Compson is just one relatively minor character; her namesake uncle figures much more prominently and is in fact the subject of the novel’s arguably most complex and most-dissected section. In the Hollywood version, headstrong, rebellious and acerbic Quentin (Joanne Woodward, a Faulkner vet from The Long Hot Summer) is the focus. She is the engine that drives the film as it explores her relationships with her legal guardian Jason (Yul Brynner) and her wayward mother Caddy (Margaret Leighton) over the period of a few heated days. Transforming The Sound and the Fury into a coming-of-age story, Quentin’s narration opens and closes the film. She describes the family’s Jefferson, Mississippi home as “a house where I’m not loved, not wanted and never have been,” and asserts that her caregiver Jason is her “enemy.” Whereas the original novel paints a full picture of the multi-generational Compson clan, the screenplay doesn’t have that luxury, and quickly establishes that the fortunes of the family have considerably fallen over the years. Woodward, who was already an Oscar winner for The Three Faces of Eve, anchors the film with her quietly dignified, largely subtle performance as a defiant young woman on the precipice. Despite being a decade too old for the teenage role, Woodward convincingly leaves viewers wondering, Will she fall victim to her family’s curses? The bewigged Brynner, playing the revised role of Quentin’s unrelated-by-blood step-uncle, is credible despite having no trace of a Southern accent and never quite abandoning memories of The King of Siam. He brings the requisite intensity and chilly demeanor to the role not to mention a sexual frisson during his uncomfortable confrontations with Woodward’s Quentin. Both Brynner and Woodward allow for glimpses of the vulnerability under their characters’ thick skins despite the numerous scenes in which they trade withering, barbed insults. As the mother that abandoned Quentin at birth, Margaret Leighton gives the film’s most affecting performance. As the utterly self-absorbed, fallen Southern belle with nowhere else to turn, she cuts a pathetic, pitiable figure worthy of Tennessee Williams. The supporting cast also contributes mightily. The great Ethel Waters makes the most of a thankless role as the family maid, and Stuart Whitman brings a note of menace and danger to his role as a hunky carnival worker who catches Quentin’s eye. Jack Warden is dignified as mute Benjy Compson, who would today be labeled severely autistic. As Howard Compson, John Beal offers an explosive moment of confrontation with Leighton’s selfish Caddy, chastising her for her promiscuity and blaming her for the erosion of the family’s fortunes. Ritt directs this streamlined tale with a sure hand, ably assisted by the score of Alex North (A Streetcar Named Desire, Spartacus). North was an expert at incorporating jazz motifs into his film scores, and The Sound and the Fury benefits greatly from it. Often his music echoes the onscreen action in the prevailing style of the period, but it’s appropriately steamy, seductive, lush, rueful or brash as called for. His bold, brassy main title music immediately delivers tension, and he knows when to lather it on and when to hold it in reserve. As the signature feature of a Twilight Time Blu-ray is its presentation of a film’s musical score, an isolated score track of North’s music is present here. Unfortunately, it’s the only bonus feature on this disc. (A featurette or commentary exploring the film’s relationship to the novel would have been a particular treat.) However, it’s an expectedly impressive treat. A booklet with an informative, entertaining essay by Julie Kirgo is also part of the package. The movie’s DTS-Master Audio 2.0 mix is solid, with good fidelity and a clean presentation. Video quality is also not to be sniffed at in this 1080p transfer of the film (shot in CinemaScope). The visuals aren’t stunning (and there’s no local color, as The Sound was shot on the Fox backlot) but the transfer is accurate and pleasing with just a few blemishes. Martin Ritt’s The Sound and the Fury never achieved anywhere near the same place in the Hollywood pantheon that William Faulkner’s original novel did in the literary world. Although the movie is a very different creature than the book, it’s an enjoyable melodrama with some ace performances. As an alternate look at a beloved and fascinating story, it’s recommended, and Twilight Time’s BD is a fine home video presentation.